According to report, many users are facing Group Facetime not working problem at the moment. But good news is that the Apple is aware of this bug. Few days back, users have also noticed Apple Facetime (ft) calling issue. Let’s take have a look at some users’ tweets on the matter “Group Facetime down” here. Is other people’s Group FaceTime not working? So Group FaceTime not working ? Report says, Apple took the feature offline after Facetime calling issue came to light. For those who are not aware, bug occur lets you hear the audio of someone you call even before they pick up Facetime video call. Let’s take a look at some users’ reports here. 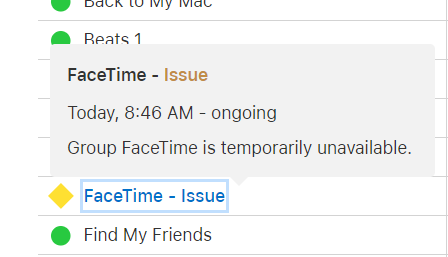 It looks like Apple have disabled Group FaceTime calls, which should mitigate this issue until they push a software update. Group Facetime bug can be reproduced by making video call to a person in your contacts, then tap on “Add person” followed by own number. A group call is initiated in such a way that you could be able to hear the person you called even before they answer the call. Actually, this exploit comes into light after when Apple had trolled other Smartphone manufacturer on the privacy. Apple had put up billboards in CES in Las Vegas this year saying what happens on your iPhone stays on your phone. Now the company itself is getting trolled for this. Hey, remember that time @Apple made that privacy themed billboard at CES? Good news! Apple has already said that Group Facetime bug will fix later in this week. It is not confirm that when exactly this outage will be fixed. Anyway, we are researching on matter “Group Facetime not working” and definitely post an update, if it will come in future. For any suggestions or queries, please write on comment box given below.